At Maiden Lake, Dr. Hoover (left) and Rev. 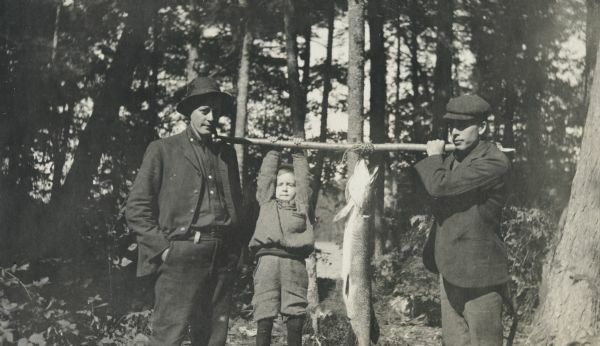 John Robertson Macartney (right) are holding a pole with a large pickeral, the size of a boy, hanging from it. Page heading reads: "Rev. J. Robertson Macartney, Pickeral, Maiden Lake 1903." Caption below reads: "Dr. Hoover." Rev. John Robertson Macartney was a minister at First Presbyterian Church in Oconto, WI in 1903. Lucy and W.A. Holt were devout Presbyterians.